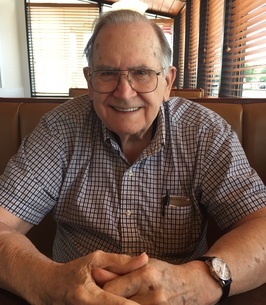 Dale Largent, 90, of Independence, MO passed away October 29, 2018. A visitation will be held from 12-1:30 p.m. on Friday, Nov. 2, at Carson-Speaks Chapel. Burial at 2:00 p.m. at Mt. Olivet Cemetery. Dale was born March 5, 1928 in Galena, KS to Dearell and Cecile (Waughtel) Largent. He was preceded in death by his wife, Joyce Largent; and a son in 1978, Paul Largent. Dale is survived by his three children and spouses, Mark Largent (Marla), Terri Miller (Larry) and Kathe Henderson (Tom); nine grandchildren; and sixteen great grandchildren. To plant a tree in memory of Dale Leon Largent, please visit our Heartfelt Sympathies Store. In lieu of sending flowers, please feel free to donate to the Veterans Community Project of Kansas City that builds houses for veterans. Envelopes will be available at the visitation on Friday. If you are unable to attend, and wish to donate, please visit the website for VCP.